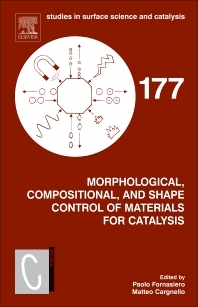 Morphological, Compositional, and Shape Control of Materials for Catalysis, Volume 177, the latest in the Studies in Surface Science and Catalysis series, documents the fast-growing developments in the synthesis, characterization, and utilization of nanostructures for catalysis. The book provides essential background on using well-defined materials for catalysis and presents exciting new paradigms in the preparation and application of catalytic materials, with an emphasis on how structure determines catalytic properties. In addition, the book uniquely features discussions on the future of the field, with ample space for future directions detailed in each chapter. Paolo Fornasiero is Professor of Inorganic Chemisty in the Department of Chemical and Pharmaceutical Sciences at the University of Trieste, Trieste, Italy. He obtained his PhD in heterogenous catalysis at the University of Trieste in 1997. He is an associate researcher of the National Council of Research (CNR) and from 2008 he has been the scientific responsible of the CNR Research Unit associated with the Institute of Chemistry of OrganoMetallic Compounds (ICCOM) of Florence and located at the University of Trieste, Department of Chemical and Pharmaceutical Sciences. He is co-author of more than 180 publications on ISI journals, 3 patents, 11 book chapters and numerous conference presentations. In 2016 he was awarded the IACS (International Association of Catalysis Societies) Heinz Heinemann Award, for his remarkable contribution to catalyst science and technology achieved during the past four years in the development of novel nanostructured catalysts. He has also been awarded the 2013 Chiusoli Medal for his contribution to research in the field of Catalysis, the 2005 Nasini Gold Medal for his contribution to research in the field of Inorganic Chemistry and the 1994 Giuseppe Stampacchia award for his first publication on an International Journal. From December 2013-July 2014 he was visiting Professor at King Abdullah University of Science and Technology (KAUST) in Saudi Arabia. His scientific interests are in the field of material chemistry, with attention to the design and development of multi-functional metal-oxide nanosystems for their advanced applications in energy related material science and environmental heterogeneous catalysis. Matteo Cargnello is Assistant Professor of Chemical Engineering and Terman Faculty Fellow at Stanford University, Stanford, CA. His group research interests are in the preparation and use of uniform and tailored materials for heterogeneous catalysis and photocatalysis and the technological exploitation of nanoparticles and nanocrystals. Reactions of interest are related to sustainable energy generation and use, control of emissions of greenhouse gases, and better utilization of abundant building blocks (methane, biomass). Dr. Cargnello received his PhD in Nanotechnology in 2012 at the University of Trieste (Italy) and he was then a post-doctoral scholar in the Chemistry Department at the University of Pennsylvania (Philadelphia) before joining the Faculty at Stanford. He is the recipient of the ENI Award Debut in Research 2013 and the European Federation of Catalysis Societies Award as best European PhD thesis in catalysis in 2013.